There is a lovely linky running over on the Mama Courage blog. It invites bloggers to get over any hang ups they may have and let the kids get… well messy. 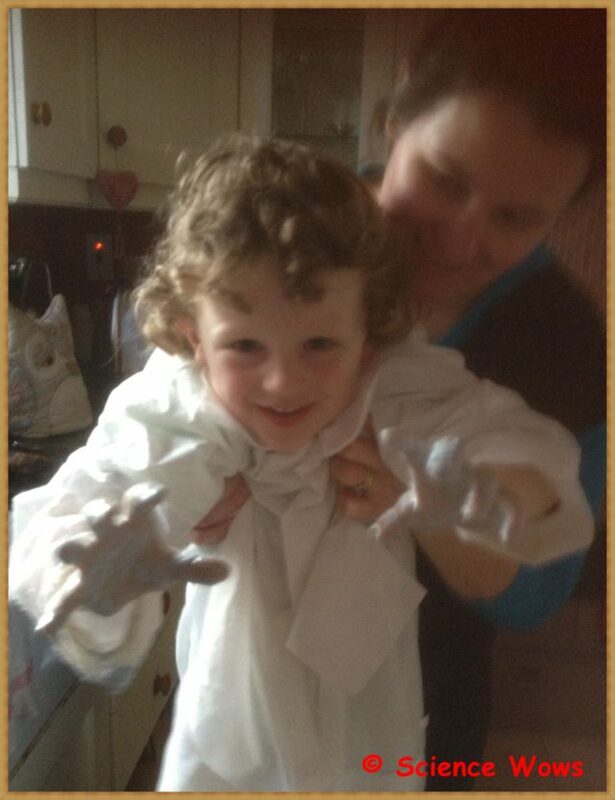 Messy play is great for children as a fun, tactile, interactive activity. We are all for it in this house. I thought the linky would be a great wayto share some of our favourite messy experiments with you all. I hope that these entice you to roll up your sleeves and get stuck in to some messy play science, just don’t look at me when it comes time to clean up! Of course this is top of the list… messy and slime are interchangeable really, aren’t they? Add one cup of water to the first bowl and mix in a teaspoon of borax powder until it is all dissolved. Add a cup of PVA clue to the second bowl; add a cup of water and mix well. 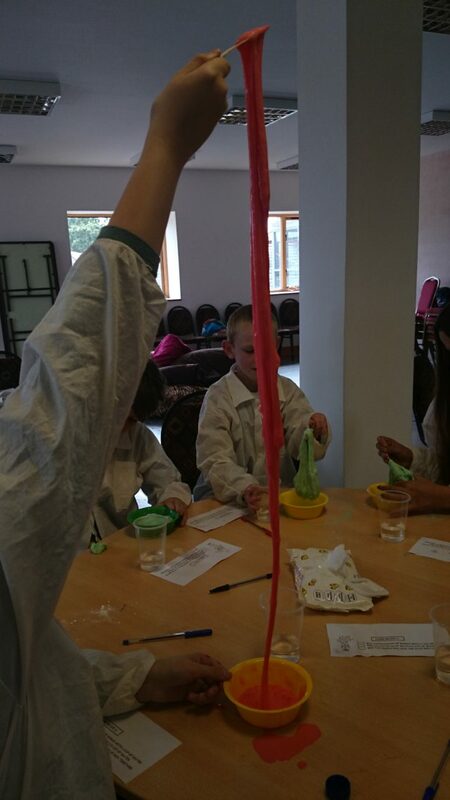 If you would like to colour the slime add a few drops of your chosen food colouring to the glue mixture and mix thoroughly. Add the borax solution to the glue mixture and start to stir immediately… you will notice that the glue turned to slime almost straight away. The slime can be stored in an airtight container and will last for years once it is not allowed to dry out. This stuff is very messy but oh so much fun. Not just for the kids either, once adults get their hands on this goo their is no stopping them. It makes a great stress reliever… honestly, have a go! Mix the cornflour and water together in the bowl (approximately one cup of cornflour to two cups of water). Add a few drops of food colouring if you wish. Once it is well mixed it’s time to get stuck in. First place your hands into the goo and slowly lift them, watching how it runs through your fingers. Now try punching the surface of the ooblecks with your fist, you may be surprised with the result. Ooblecks is what we call a Non Newtonian Fluid… meaning that it does not follow the laws of Netonian Physics. When left to rest it looks just like a regular liquid. However when disturbed by strong hitting, shaking or pulling it acts more like a solid. It is a phenomenon worth studying and although still a bit of an enigma, scientists think that the material normally acts as a liquid but can produce a sudden, local reaction to rapid impact and stress, reinforcing the area and briefly solidifying the suspension. Ooblecks takes it’s name from the green slime that fell from the skies in the Dr Seuss booh “Bartholomew and the Oobleck“. You have probably all seen the coke and mentos experiment, maybe you have even tried it yourself. 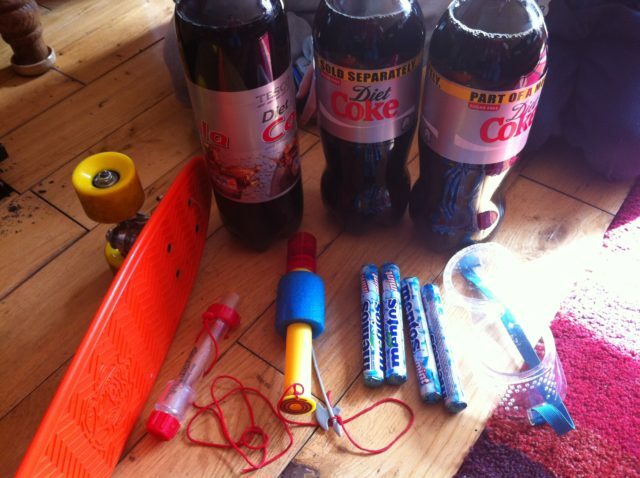 The basic idea is that you want to get as many mentos as possible into a bottle of coke as quickly as you can. … and told them to devise their own version of the coke and mentos experiment. Firstly, this is not thought to be a chemical reaction between the coke and the mentos. It is most likely a physical reaction known as nucleation; The coke is full of carbon dioxide gas, to give it its fizz; the mentos are full of tiny little craters on the surface of the sweet, the carbon dioxide gas is able to form bubbles in these “craters” producings thousands of tiny bubbles all at once; these bubbles of gas are under a lot of pressure within the bottle of coke and so come shooting out the mouth of the bottle. If anyone knows anything about Newton and his laws they will know that every reaction has an equal and opposite reaction (Newton’s third law of motion)… so the coke comes shooting out of the bottle in one direction and the force of this propels the skate board forward in the opposite direction. PRETTY COOL! These are just some of our favourite messy play experiments. Check out what others are getting up to in Mama Courage’s Messy Play Project linky.